Shop online for 175 bachmann ho scale model train diesel locomotives at discounts up to 56%. This is the HO Scale DCC Boston & Maine Alco RS-3 Diesel Locomotive (#1545 Maroon/Yellow/Black) by Bachmann. Suitable for Ages 14 & Older. This is the HO Scale DCC Sound Union Pacific EMD DD40AX Centennial Diesel Locomotive (#6940) from Bachmann. Suitable for Ages 14 & Older. This is the HO Scale DCC Ready Canadian National GP38-2 Diesel Locomotive (#4720) by Bachmann. Suitable for Ages 14 & Older. 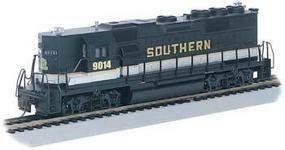 This is the HO Scale Norfolk Southern (THoroughbred) GP38-2 Diesel Locomotive (#5616) by Bachmann. Suitable for Ages 14 & Older. This is the HO Scale DCC Sound Union Pacific EMD DD40AX Centennial Diesel Locomotive (#6929) from Bachmann. Suitable for Ages 14 & Older. This is the HO Scale DCC Canadian National Alco RS-3 Diesel Locomotive (#3019) by Bachmann. Suitable for Ages 14 & Older. This GE 70-Ton Diesel Locomotive is an HO Scale Model by Bachmann. Suitable for Ages 8 & Older. This is the HO Scale E-Z App Train Control New York Central FT A-Unit Diesel Locomotive (#1600) by Bachmann. Suitable for Ages 14 & Older. This is the HO Scale New England Central GP38-2 Diesel Locomotive (#3848) by Bachmann. Suitable for Ages 14 & Older. This is the HO Scale DCC Union Pacific EMD DD40AX Centennial Locomotive (#6910) from Bachmann. Suitable for Ages 14 & Older. This is the HO Scale Alaska Railroad F7-A Diesel Locomotive from Bachmann. Suitable for Ages 14 & Up.